Michael Borkowsky’s perfume making workshops give participants the opportunity to learn more about the perfume making process and how it can be applied to portraiture. 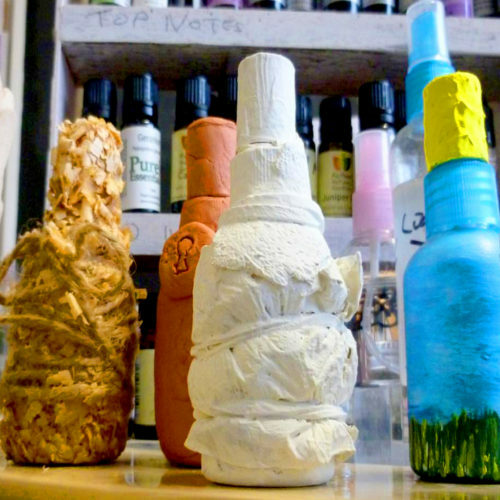 He begins by talking about his approach to perfumery from a contemporary art standpoint. This includes talking about using perfume and scent as a means of communication, and about how we can create portraits by carefully choosing and combining essential oils and fragrance oils in order to capture the essence of who we are. Michael will also talk a little about the craft and science of perfumery, including the differences between fragrance families; fragrance notes; types of oils and types of diluted forms. He will then proceed to give a working demonstration of the perfume making process, delivering a step by step instruction of how to make a 50ml Eau De Toilette. Participants will then have an opportunity to make an Eau De Toilette themselves and will be guided by Michael. Participants will then be able to label the bottle and take it home on the day. Help us build a model polysaccharide molecule and out of confectionary learn about sugar chemistry at the same time. The aim of The Maker Games is to create a humorous and surreal environment where games develop skills, confidence and self-belief of individuals and groups. Dr Anne Schiffer's workshop explores design thinking in relation to activism.